A major step in Minecraft is building a portal that transports you from the classic overworld into the Nether dimension, which is a dangerous place with an interesting new set of blocks and monsters. To unlock more items and reach the next stage of the game, you have to reach the Nether. 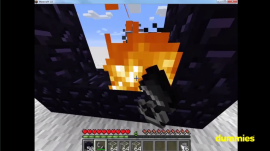 Gain access to this hellish dimension by learning how to make a nether portal following the steps below. 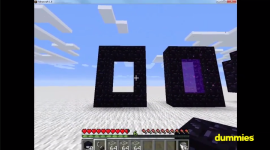 Nether portals can be built in a variety of sizes. In order to build a Nether portal, you need at least ten blocks of obsidian to create the portal frame and a Flint and Steel to light the portal. Collecting obsidian blocks can be done in multiple ways. If you have a diamond pick axe, you’ll be able to simply mine for blocks of obsidian using that rare piece of mining equipment. However, since diamonds are rare and difficult to find, it can take a while to create this tool and mine enough obsidian to create a nether portal. Alternatively, you can create obsidian blocks through the combination of two other elements, lava and water. The video above shows you the best techniques to use to efficiently create obsidian blocks in the appropriate portal structure without harming your character or wasting resources. Build a portal frame using 10 or 14 obsidian blocks. The simplest nether portal frame is a 4×5 rectangle of obsidian blocks with the corner blocks replaced with placeholder blocks. Use the flint and steel from an iron ingot to light the interior. This creates a purple smoke, which is the portal to the Nether. Stand inside the frame for 4 seconds until the screen fades into purple. You will soon appear in the Nether next to a second portal that can take you home. Now it’s time to explore the hell-like dimension, filled with lava, fire, and dangerous mobs like skeletons and zombies!